I thought I would post about some things I have found and used to help with role playing and or would soon be available. Make PVC furniture grade not water grade pipe fittings. These can be very useful to make buildings. I have enough to make four buildings with canvas walls. Canvas from painters canvas at Home Depot. Excellent for making buildings or star ship rooms? You can make and transport a building in a duffle bag for easy set up and tear down. A little paint on the canvas to turn it into a mural of a building or anything else goes a long way. Pdf file for buildings here. Is software for running a LARP / augmented reality game and is free. I also posted this in Away teams. These are swords from a Kickstarter campaign which are just about ready for release. Nice thing is they know the difference between a sword hit and hitting a person. Not very expensive and could be useful in away missions. Want to make fast views of space. Here is software to help you. Universe image creator is very easy to use. Fast and simple. Be it chromecast or another product, what better way to add to story telling then by casting a location to a tv in order to aid in telling a story. Limited only by photos and imagination anything from floor plans to monsters can be cast to a tv in order to tell a story. Example: You see castle on hill. Cast photo. Do you want to go inside? Yes. Cast Front entrance floor plan. I bought a phone simulator from this company a few years back. It allows four phones to work like a real world phone system. The catch you cannot call out side the four phones. It has dial tone, busy signal and can be programmed with telephone numbers for each line. However, you cannot call anywhere but these four phones. A bit pricy but works like a charm. Updated daily prop website or nearly every day. I like those swords. I've already mentioned that I plan on making Laser Tag pistols a plug-in interface for PvP in Away Team, but those swords look like fun too. I agree, I pre-ordered a set already. I thought you might like them because of your conversation about hooks to props. I also had a pm regarding ARIS so, thought why not post about several of the things I have already used. Anything else in the list stand out....idea wise...? Since we are talking about Star Trek bridges often and how it relates to Artemis. Here is a source for Star Trek TOS bridge props. I like the helm alert and red alert items. Now have to play lotto more often. Well, I think the problem is going to be hooking it up to a Bluetooth interface, but yes, I think that would be perfect. Something like a Laser Tag system where you have a beam of light which strikes a target, and the device is capable if registering that hit. If I can feed that into a Bluetooth sender, I can make Away Team pick up that signal, and register a hit on the players in PvP. It wouldn't be very useful in PvE, because there's no target to hit. But it could add another layer to PvP gameplay, and allow more skill, instead of just shooting in the area of the other player and it hits automatically. 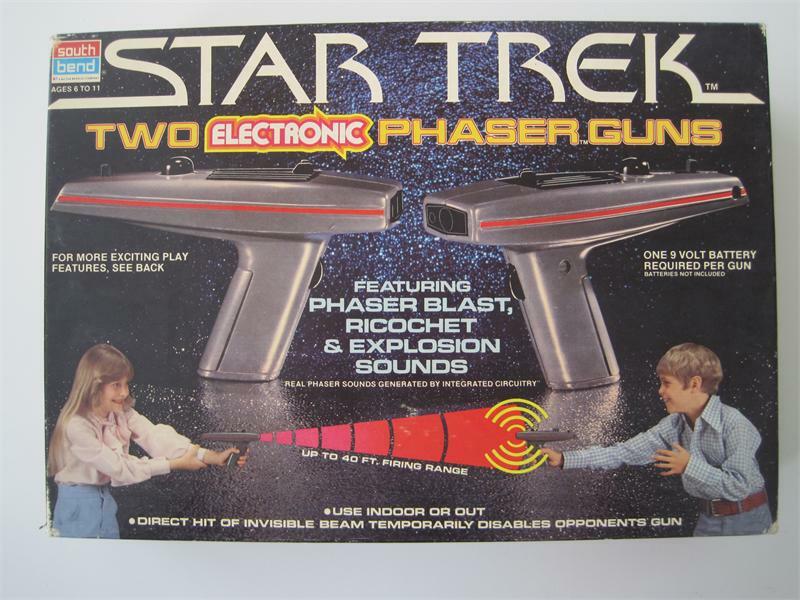 I'll add that it would probably be possible to adapt a prop like that so you could mount your phone on the phaser while you are playing. The trigger could be tied to the fire button through Bluetooth. But you'd probably want to cannibalize a cheap phaser prop for that, not something that functional. Perhaps for PvE you might find a proxy element? Not sure what might work for this.... Just spit balling.....lRFID / NFC or something? Openfire is an open source free server and app to provide text messages between pcs. Archive of a large selection of magazines to be mined. Those that remember Starlog & IF magazine. Copies of other magazines by Starlog can also be found here. This may be of interest to some. More than 140 applications / servers are available for free. If your running a LARP and want to use a Facebook style app for down time gaming then check out EXO. You might also want to use Moodle for your Space Academy? I've run lasertag-based events and LARPs for years and years. For Artemis Away Team, I recommend using the Hasbro LTAR as a base platform to hack around with and maybe synch into your smartphone-based system. The Hasbro LTAR lasertag gun was designed with a built-in iPhone jack interface that could probably be hacked by someone knowledgeable (not me.) It is retro-compatible with the older programmable Tiger products like the LTTO, which might give a hacker an even broader range of options to work with. The base gun is one of the best retail-grade lasertag systems ever marketed in the US, with a surprisingly long effective outdoor range of around 100 yards in broad daylight, as well as a lower-powered indoor range setting, plus a full-auto option. Best of all, these things can be found cheap at secondhand stores. I've hoarded a couple dozen of them so far. The big drawback with lasertag is always sensor placement. The LTAR has a good 360-degree gun-mounted sensor that would be completely covered/inactivated should it be holstered. The sensor would probably need to be detached and shoulder- or headgear-mounted for serious LARP. This is a perennial problem with retail-grade systems. Tools, Toys, Gadgets, Greeblies, DMX, and RPG/LARP sourcing.